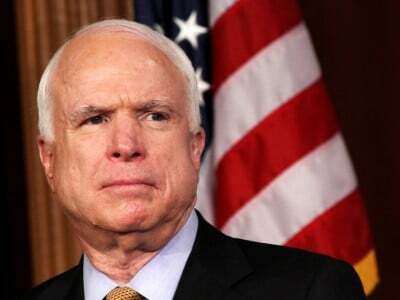 McCain served 25 years as the chairman of the International Republican Institute, a federally funded entity that intervenes in foreign elections to promote pro-American candidates. McCain often spoke as if the institute was the incarnation of America at its best. In 1997, McCain declared, “When we provide the democratic opposition in Albania with 12 Jeep Cherokees and they win an election, I’m incredibly proud.” However, the Institute was involved in violent attempts to overthrow governments in Venezuela and Haiti and was condemned for meddling in many other places. As long as pro-American candidates snared the most votes by hook or by crook, McCain had no complaints. McCain’s boundless endorsement of the current president ignored the legendary presidential deceits that trademarked the Mexican-American War, the Spanish-American War of 1898, the First World War, and the Vietnam War. Predictably, the commission concluded that Bush was not to blame for starting the Iraq War on false pretenses. But the American media lapped it up and the charade did nothing to prevent McCain from securing the Republican presidential nomination the following year. The shining moment of his campaign was his proclamation, “We are all Georgians now!” in response to a border clash that the Republic of Georgia commenced against the Russian Federation. McCain’s bellicosity against Russia never died. He also proclaimed during that campaign, “I know how to win wars. And if I’m elected president, I will turn around the war in Afghanistan, just as we have turned around the war in Iraq, with a comprehensive strategy for victory.” McCain never explained how he learned how to win wars (not a lesson taught in North Vietnamese prisons) or why he advocated bombing more than a dozen nations throughout his congressional career. Perhaps the only lesson McCain learned from the Iraq War was that the American media would unquestioningly glorify him for demanding foreign intervention. In 2011, he was outspoken demanding U.S. bombing of Libya — widely considered the biggest foreign-policy blunder of the Obama administration. In April 2011, he visited rebels in Benghazi and labeled them heroes. Yet, as a Wikileaks disclosure revealed, he had sung a different tune two years earlier when he visited Tripoli. Meeting with officials of Muammar Qaddafi’s regime, McCain “pledged to see what he could do to move things forward in Congress” regarding a Libyan request for U.S. military equipment, according to a confidential U.S. embassy cable. After the United States helped topple the Qaddafi regime, chaos erupted and four Americans, including the U.S. ambassador, were killed in Benghazi. A few years later, slave markets were operating in the nation that McCain and Obama had so proudly liberated. Most of the media ignored McCain’s role in making the Syrian conflict longer and bloodier than it otherwise would have been. That is no surprise, since American politicians across the board are perennially absolved by the ideals they invoke when championing foreign wars. But the moral bonus points are void beyond the national borders. Idealistic pretenses can spur vast resentment because “the American judges himself by the way he feels, whereas the foreigner judges him by what he does,” as Irving Babbitt explained after World War One. There are plenty of nasty dictators in the world but U.S. government efforts have dismally failed to spread democracy this century. John McCain was in the forefront of prominent Americans who had “learned nothing and forgotten nothing” from recent U.S. pratfalls. Instead, he continued talking as if foreign interventions could be a deft blend of Jesus and General Sherman, righteously burning a swath through Georgia. America cannot afford an idealism that consists of little more than combining bombing and wishful thinking. We should not forget the Americans, Iraqis, Syrians, and Libyans who died in part because of policies McCain championed. The most valuable lesson from McCain’s career is to reject the folly of militarized idealism. This article was originally published in the December 2018 edition of Future of Freedom.